... Maybe this is the pic that took me longest time to draw (about 1 week) Christmas is my most favorite time of the year and that is why I put very much effort and tried to do my best for this pic. 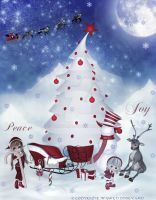 This is a christmas card from me to you ^ ^ Wish this pic make you feel happy and merry chritsmas to you all. Lovely work, well worth the time you put into it! I have featured this piece in my journal here [link] Have a great week! Oh thanks so much that you feathered this pic into your journal ^ ^ Have a great weekend too!